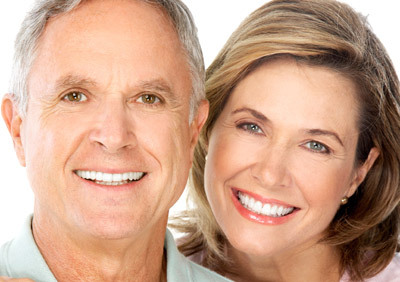 The restorative work for dental implants is performed by your general dentist. Your restorative treatment begins with specialized impressions that allow your dentist to produce a replica of your mouth and implants. Your dentist will also make “bite” records so that we see the relationship of your upper and lower jaws. With this information, your dentist will make the abutments (support posts) that attach your replacement teeth to your implants. Various types of abutments exist. Frequently, it is possible to use “off the shelf” abutments. Other times, custom abutments must be made of gold or a tooth-colored ceramic material. As you can imagine, these custom made abutments add to the cost and treatment time involved. Which abutment to use is a decision that often cannot be made until after healing is complete and impressions have been made. If your final restoration is a removable denture, you will need to see your dentist as many as five office appointments (although it may be fewer) over the following several months. During these appointments, he or she will perform a series of impressions, bites and adjustments in order to make your new teeth, as well as the custom support bars, snaps, magnets, or clips that will secure your teeth to the implants. During this period, every effort will be made to ensure you have comfortable, temporary replacement teeth. In general, once your implants are placed, you can expect your tooth replacement treatment to be completed anywhere from 1 to 12 months. For these reasons, it is difficult for us to tell you exactly how much the restorative phase of your treatment will cost, although you should receive a reasonable estimate from your dentist office. It also is difficult to give you a specific timeframe for completion of your treatment until after the implants are ready for restoration.